Dr. Palash Sen, Ira Dubey , Yashpal Sharma ,Tinu Anand, Kymsleen Kholie, Prisha Dabbas, Satish Sharma, Saurabh Pandey & Bishnu Khargharia. 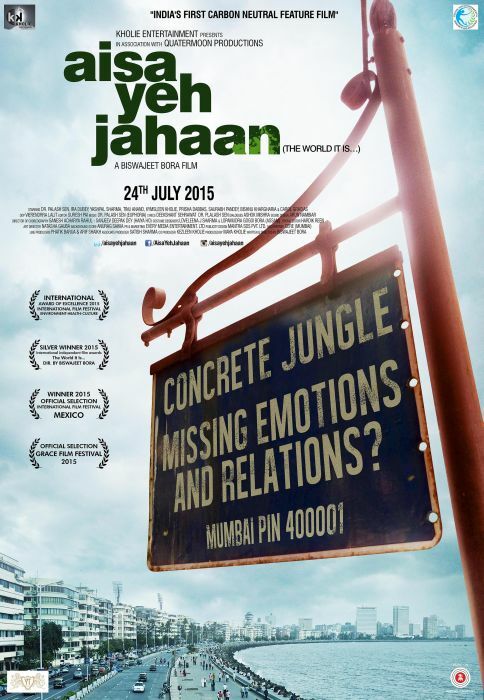 The film is set in Mumbai, tells the story of ever growing human detachment with nature and how an urban family gets trapped in the concrete jungles of a metropolis. It is a story of a nuclear family and their young maid, having moved from a small town from Assam to Mumbai (representing a metro city) and through their story we see how people move from small villages and towns to bigger cities looking for better life and job opportunities and end up turning concrete jungles into bigger concrete jungles. Dr. Palash Sen, Ira Dubey , Yashpal Sharma and Kymsleen Kholie do a good job and add value to their characters. Music by Dr. Palash Sen (Euphoria) blends well with the film and adds the commercial element to the film. The songs could have been promoted effectively for box-office success. Writer-director Biswajeet Bora touches upon a good subject and handles it with kids gloves. He could have increased the pace of the film to make it crispier. He has tried to touch upon three to four layers of stories but somehow the jumps in the film aren’t blended well. However, a decent job done since this film has managed to hit the eye-balls at the festival circuit. The film will do average business at the box-office since it lacked the promotion and has fairly known faces in the film. A good effort though, especially since Assam has been filmed pictorially and is an effort to bring the state some recognition. This entry was posted in Trending News and tagged Dr. Palash Sen, Film Review - ‘AISA YEH JAHAAN’ (the world it is…), Ira Dubey, Kymsleen Kholie, Prisha Dabbas, Satish Sharma, Saurabh Pandey & Bishnu Khargharia., Tinu Anand, Yashpal Sharma.